O believers, raise not your voices above the Prophet's voice, and be not loud in your speech to him, as you are loud one to another, lest your works fail while you are not aware. (Al-Hujurat 49:2). With all the different principles and beliefs, the respective elders of each group is respected in a special way. Cities, streets, universities, airports, schools and organizations are named after such people. Likewise, in Islam, individuals and even some plants and inanimate objects are considered sacred. When we made you equal with the Lord of all Being. Magnify the Name of thy Lord the Most High. (Al A’la 87:1). And the Mighty Qur’an (Al HIjr 15:87). We must therefore know the Holy Qur’an as Great, and when the Holy Qur’an is known (Holy Qur’an 56:77), we must then revere it, and since the Holy Qur’an is praiseworthy (Qur’an 50:1), we must therefore praise it. 3. The rights of the Divine Guides, all of the Prophets and their successors and especially that of the Prophet (pbuh) and his Purified Household (pbuh), have been given a special status which in the aforementioned Surah1, the respect they deserve has partly been mentioned such as not going ahead of them, not raising or voice to be louder than theirs, and in other Ayahs, to send our praises to the Prophet (pbuh). God and His angels bless the Prophet. O believers, do you also bless him, and pray him peace. (Al Ahzab 33:56). And their Prophet said to them, 'The sign of his kingship is that the Ark will come to you, in it a Shechina from your Lord, and a remnant of what the folk of Moses and Aaron's folk left behind, the angels bearing it. Surely in that shall be a sign for you, if you are believers. '(Al Baqarah 2:248). The chest that Prophet Moses’(pbuh) placed him in when she sent floating, was used after his death to place the tablets and scrolls and of what was with him in terms of prophetic miracles and the belongings of his offspring. The chest was so sacred that the Angels would carry it and then bring it back to lead them to victory against an evil powerful tyrant. 4. In Islam, the parents have a special sanctity and greatness associated with them. In the Qur’an, monotheism precedes respecting and doing good to the parents five times and showing gratitude towards them is placed next to showing gratitude to Allahﷻ. 'Be thankful to Me, and to thy parents. (Luqman 31:14). 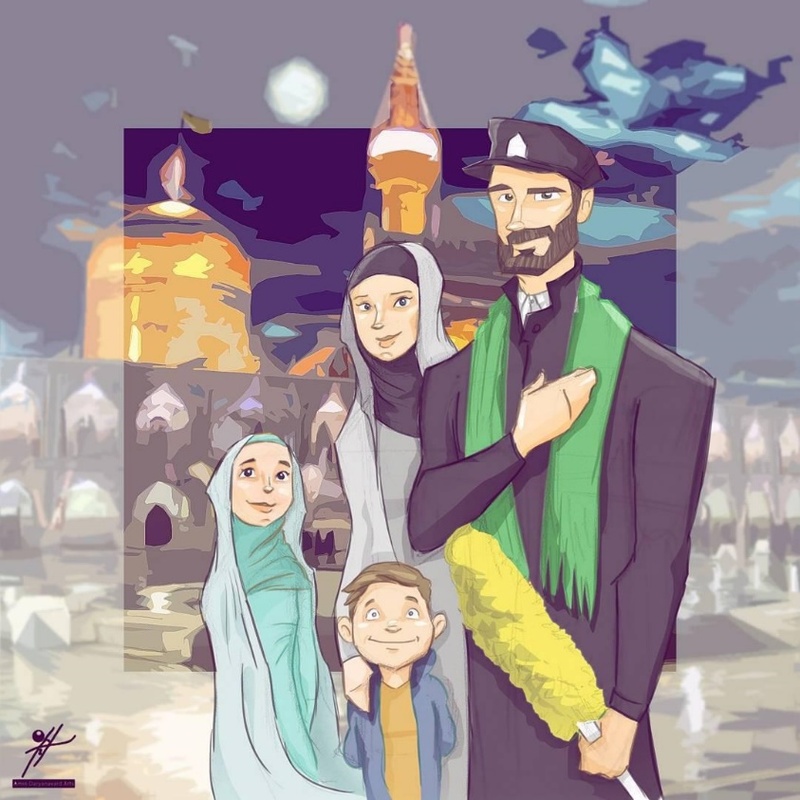 Respecting the parents is to the point where looking at them with the look of love and respect is considered worship and we are advised to not raise our voices above theirs, and if we go on a trip that causes harm to them is prohibited, and prayers during that travel must be prayed in full (not shortened). Put off thy shoes; thou art in the holy valley, Towa. (Taha 20:12). The idolaters are indeed unclean; so let them not come near the Holy Mosque. (At Tawba 9:28). Places of worship and mosques are sacred and when we go to such places, we should go clean and well presented. Take your adornment at every place of worship. (Al Araf 17:31). Or defiled unless you are traversing a way - until you have washed yourselves (An Nissa 4:43). Purify My House (Al Baqarah 2:125). Lord, I have vowed to Thee, in dedication, what is within my womb. (Al Imran 3:35). 6. A person with belief also has sanctity and greatness, so much so that the honor of the believer is more than the honor of the Ka’baa and the persecution and backbiting them is prohibited and defending their right is obligatory, and even after death, it is prohibited to exhume the grave. In the Name of God, the Merciful, the Compassionate Surely We have given thee abundance; so pray unto thy Lord and sacrifice. Surely he that hates thee, he is the one cut off (Al-Kawthar 108:1-3). Thou art not, by the blessing of thy Lord, a man possessed. (Al Qalam 68:2). Thou art truly among the Envoys (messengers) (Ya Sin 36:3). We have not taught him poetry; it is not seemly for him. (Ya Sin 36:69). Indeed, the answer to the one who insults the best of creations as being “cut off” is to be given Kawthar, and the everyone’s eyes were bedazzled and everyone’s mind was awed. For the last Ayah of Surah Al-Kawthar (108:3), we understand that Kawthar is the opposite of “cut off”. The Prophet (pbuh) was mocked as being one who is “cut off”3, but Allahﷻ states in the Holy Qur’an “he is the one cut off” (Al-Kawthar 108:3). “Cut off” is a term used by Arabs to describe one who is left with no heir as a result of having no sons, and with their death, they leave no trace behind. “Kawthar” in this Surah is used as an answer to that mockery, and the best evidence of it are the twelve Divinely Guided leaders from Syeda Fatima(as), the daughter of the Prophet. So let not their possessions or their children please thee; God only desires thereby to chastise them in this present life, and that their souls should depart while they are unbelievers (Al Tawba 9:55). When comes the help of God, and victory, then glorify (An Nasr 110:2-3). so pray unto thy Lord and sacrifice (Al Kawthar 108:2). Indicating the provision of “Kawthar” is more significant than the waves of disbelievers entering Islam. 3. Having no surviving son to be his heir.